For the past two weeks, the on-court action in the NBA has been consistently overshadowed by the drama behind the scenes. Ho-hum, James Harden scored 40-something for the billionth game in a row. Whatevs. What we really want to talk about is where Kevin Durant will be playing next year! 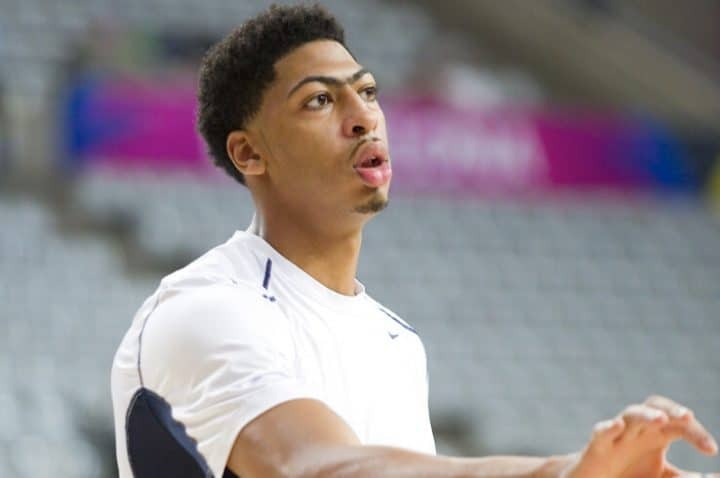 Since last Monday: Anthony Davis told the New Orleans Pelicans he won’t re-sign there, an eyebrow-raising development for such marquee teams as the L.A. Lakers and Boston Celtics; Kyrie Irving indicated he’d be exploring his non-Boston options this offseason; the New York Knicks went into mega-tank mode by shipping Kristaps Porzingis (who, like Davis, pretty much demanded a trade) to the Dallas Mavericks; and in the middle of the night Tuesday, the Philadelphia 76ers traded a slew of future pieces for a right-now piece, Tobias Harris. The NBA’s trade deadline is tomorrow at 3 p.m. ET. After that, fans should have a decent sense of what uniform all of the significant players will be wearing this postseason. And that makes right now one of the last great opportunities for basketball bettors to seize upon title odds that might not be fully reflective of the final roster constructions. Here’s a look at the odds on the relative favorites to win the 2018-’19 NBA title. For variety, we surveyed one online sportsbook in New Jersey, one in Pennsylvania, and one in Nevada. All odds are as of 9 a.m. ET on Wednesday, Feb. 6, 30 hours before the trade deadline. The above chart serves as a handy reminder to always shop around if you can. There’s no reason to bet $250 to win $100 on the Warriors if you have access to another sportsbook that lets you risk $175 for the same payout. Drilling down on some specifics, we can see that even in the Sixers’ home region, Parx didn’t react quickly to the news of the Harris trade. But an hour later, the 76ers dropped from +1600 to +1400, and it’s probably only a matter of time before Parx has the same odds as BetStars. The Celtics are a fascinating team, and the books are split on how seriously to take them. With a 10-1 record in their last 11, are they rounding into shape and becoming the Eastern Conference favorites they were supposed to be during the preseason? Or is the Kyrie drama a time bomb, and it’s a matter of when, not if, it goes off? Then there’s the curious case of the Lakers. They’re currently 27-27, 2½ games out of the playoffs with just 28 to play, though the Clippers trading Harris to Philly and apparently tanking the season helps a little there. Having to get through the Golden State Warriors even if they make the playoffs (possibly in the first round), LeBron James’ team shouldn’t, on paper, be any better than a 50/1 longshot to win it all. Baked into the odds, however, is the possibility that the Lakers will be LeBron’s team and Anthony Davis’ team by Thursday. After all, they have the same agent and LeBron is widely believed to effectively be the GM in LA. Is it all moot because of the Warriors anyway? If both Stephen Curry and Kevin Durant stay healthy, it’s hard to see Golden State, winners of 12 of 13, not completing the championship three-peat. Even if Curry or Durant goes down, there probably isn’t another team the books would favor over the Warriors in a seven-game series. But that’s the challenge of sports betting. If you can anticipate how things will play out better than the bookmakers, and you shop around and get the best odds at the perfect time, you can have an edge. Are you confident the starting five of Joel Embiid, Ben Simmons, Jimmy Butler, J.J. Redick, and Tobias Harris will gel? Then those Philly odds to win the conference look good. Are you confident that the Celtics will continue to get better as the season goes along and Irving won’t rock the boat? Be patient — those odds might go up a bit as the Sixers’ odds come down — then bet on Boston (apparently a safe strategy in any sport). Or do you want to believe what you’ve seen so far this season, that the Bucks and Raptors are the two best teams in the East and, unlike the Celtics and Sixers, they’ve already figured out how to put their pieces together? We have one day left for a potentially seismic odds shift to occur through something other than injury. That means bettors have one day left to get out in front of it. Then they can sit back and start paying attention again to what’s happening on the court.